Ten years after the assault on Telos that effectively ended the Great Cyber War, the Doctor, Jamie, and Zoe set out to explore the meaning of a giant Cyber-head at the galaxy’s furthest reaches. As his companions try to discover if the universe has really seen the end of the Cybermen, though, so, too, do they try to discover just who the man in the multicoloured coat claiming to be the Doctor truly is and how he has come to be there in their own Doctor’s place. Although the reason for later Doctors suddenly appearing in their earlier incarnations’ timelines is still not addressed, Colin Baker’s Sixth Doctor is the perfect counterpoint to Patrick Troughton’s Second, especially as the Sixth’s characterization here is an amalgamation of the earlier televised Sixth incarnation along with the more mellowed and compassionate audio version. Subtlety is out the window here, and Baker is clearly relishing the opportunity to add a slightly more antagonistic and gruff edge to his character while still staying true to the years of characterization at Big Finish. However, it’s the companions that keep this tale firmly rooted in the Second Doctor’s era, and both Frazer Hines and Wendy Padbury effortlessly recapture their earlier selves’ youthfulness and vigor. Hines and Baker instantly recapture a great chemistry even as Jamie remains suspicious of the Doctor, and Jamie is written as very confident and shrewd here even as events take on a more fantastic nature. The presence of the Cybermen also makes prime use of the incredibly intelligent Zoe, the script unafraid to showcase that intellect in the most dangerous of situations with the stakes at their highest. 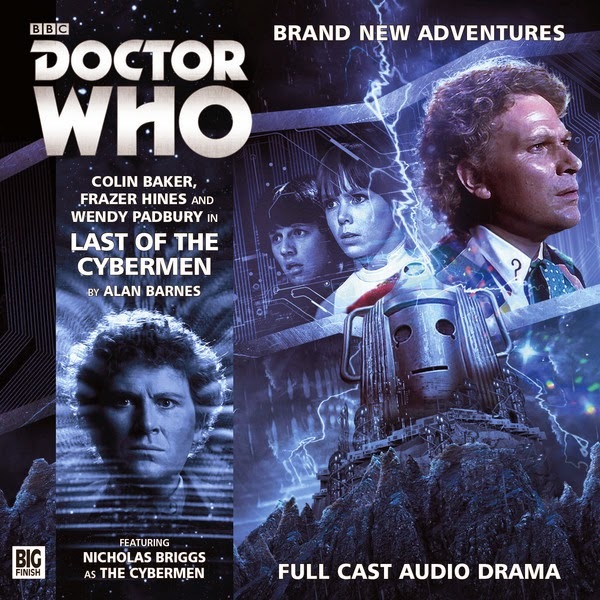 ‘Last of the Cybermen’ is a story that requires at least some knowledge of televised Doctor Who, and it’s one that will require full attention to fully enjoy. Explicitly set just before ‘The War Games,’ the story delves into Zoe’s past and makes references to the majority of early Doctor Who tales at some point while also recapping Cyberman history as Glitter guns, the Brotherhood of Logicians, Cyber-planners, and a particular missing Cyber-fleet all feature. Still, ‘Last of the Cybermen’ is brimming with great ideas and the core mystery behind the giant Cyber-head citadel is immensely satisfying as a dormant Cyberplanner waiting for an intelligent mind to activate the beacon to guide 10,000 hiding Cyber-ship slowly makes itself known. Indeed, as Zoe becomes connected to the Cyberplanner and the beacon becomes active to guide one final attack against humanity, it’s frightening to realize that this has all occurred solely because the Sixth Doctor took the Second Doctor’s place. It is stated that the Second Doctor would have left the beacon alone once discovering the presence of a dormant Cyberplanner, but the translocation of these two versions poses a threat to time itself. It seems odd that Big Finish would once more choose this combination of actors to highlight their celebratory release since they have featured together in some semblance in the Main Range before. Nonetheless, they do remain the highlight of the story and could easily carry a full series of adventures on their own merit. If one can look past the overindulgence in referencing other stories, ‘Last of the Cybermen’ packs a very emotional and visual punch with a superb performance from Lucy Liemann as the villainous Xennox. There are some odd choices as the fourth episode skips ahead of the previous three and features some forced efforts to undo the foreknowledge the Sixth Doctor has given Jamie and Zoe, but the differences between the Second and Sixth Doctors within the context of a Second Doctor story is a strong hook that comes to fruition very well, making great use of the Second Doctor’s greatest foe.